From left: VFW Post 1040 members Frank Martinez, Martin Spani and John Zambrano, Lynnwood Police Officer Ryan Hoirup and Police Chief Steve Jensen. The VFW recently presented Hoirup with the 2012 VFW Post 1040’s Officer of the Year Award. 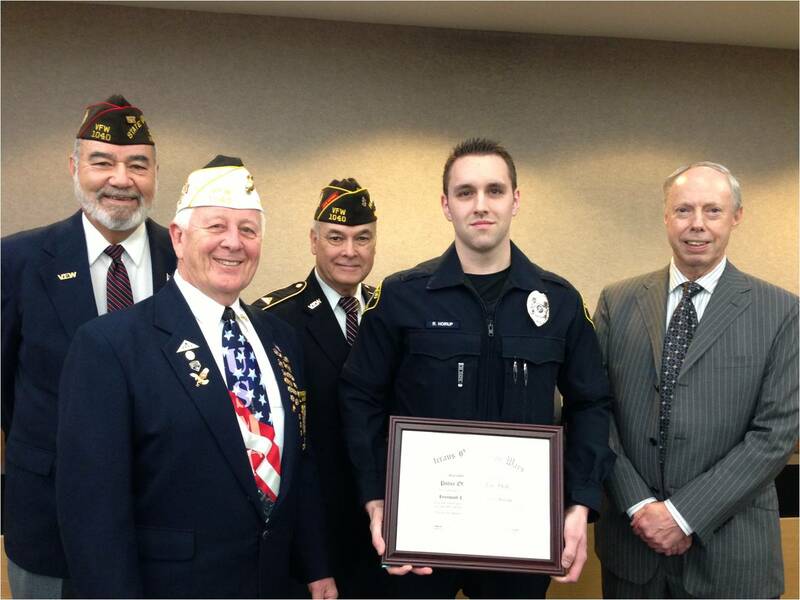 Lynnwood Police Officer Ryan Hoirup has been chosen as the Veterans of Foreign Wars (VFW) Post 1040’s Officer of the Year for his consistent, outstanding work and personal sacrifice serving the community. Officer Hoirup has been a Lynnwood Police Officer for five years and has established an exemplary work ethic and dedication to serving his community. He serves with distinction as a SWAT officer and Crime Scene Technician in addition to his regular duties as a patrol officer. On Aug. 26, 2012 Officer Hoirup was assisting fellow officers, who were attempting to make an arrest of a wanted felon in the City of Lynnwood. The suspect attempted to flee from the officers on foot. Hoirup chased after the suspect in an attempt to apprehend him. Hoirup caught up to the suspect and a struggle ensued. Unbeknownst to Hoirup, they were at the edge of an 18-foot drop off from a parking lot embankment. Hoirup and the suspect fell off the embankment and landed on the ground below. Hoirup narrowly missed being impaled by a metal stake in the ground where he landed; however, he was seriously injured from the impact of the fall. He instinctively attempted to engage taking the suspect into custody, however, could not move due to his injuries. Other officers responded to assist and the suspect was successfully captured. The fire department conducted a high angle rescue to remove Hoirup and transport him to Harborview Medical Center, where he remained for a substantial amount of time. Since this incident, Hoirup has always maintained a positive attitude and strong desire to recover from his injuries and return to full duty as a Lynnwood Police Officer. His recovery has proven to be the challenge of his life; however, his progress has been remarkable and he has returned to full duty in 2013.